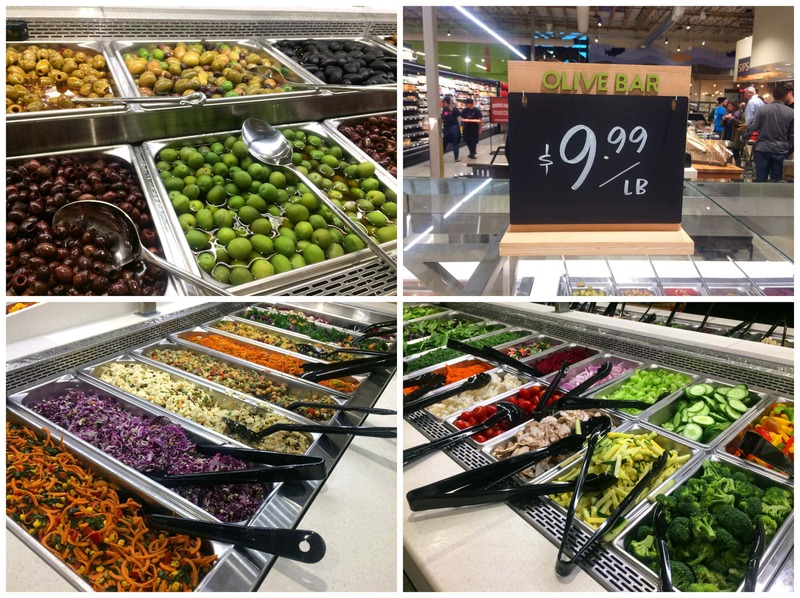 I’ve partnered with New Seasons Market to bring you this post about their newest location! Yes, I get very excited about things like quality, freshness, variety, local options and good deals. Whether you love grocery shopping like I do or are lukewarm about it, get ready for a major boost in your shopping experience because guess what? One of the coolest grocery stores ever is coming to Seattle! Today I attended the pre-opening party of New Seasons Market’s newest location on Mercer Island, off the i-90, a ¼ mile south of exit 7a. I became so absorbed in the experience of exploring the store that I ended up spending 2 1/2 hours meandering up and down the aisles, sampling food and chatting with the staff. 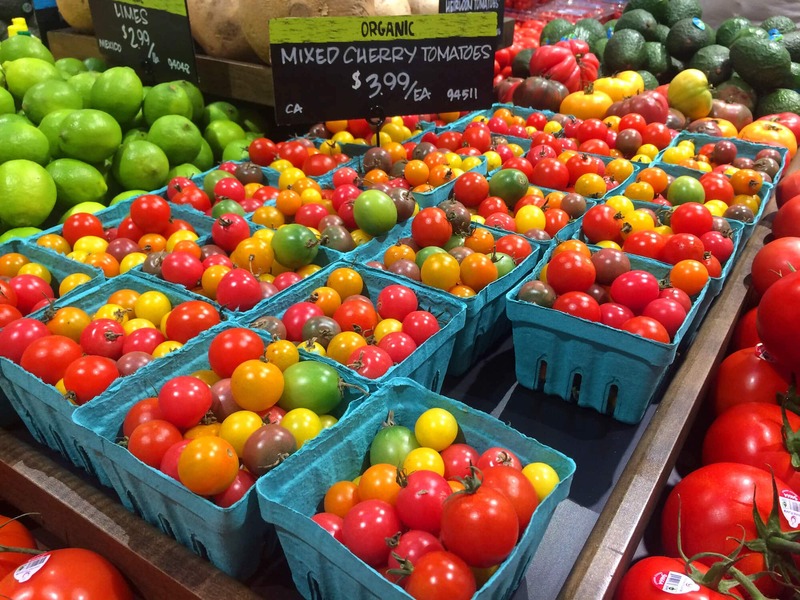 I took lots of pictures and am going to take you on a virtual tour is just a moment, but for anyone unfamiliar with New Seasons Market, let me give you brief overview. New Seasons Market is a West Coast neighborhood grocer and champion of the regional food economy. Promoting a healthy, sustainable food system, it partners with local ranchers, farmers and producers to bring its communities peak of season regional, organic produce, sustainably sourced meat and seafood, grocery classics, and a variety of grab-and-go deli options. 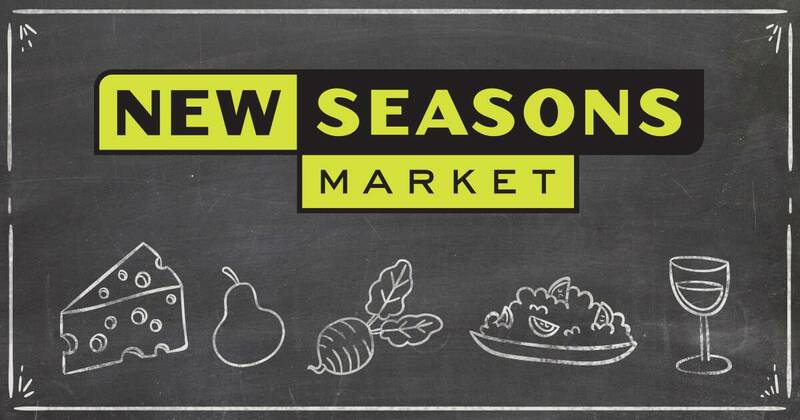 Each New Seasons Market is tailored to its specific community and commits 10% of its after-tax profits back to the community it serves. In addition, each store builds relationships with local nonprofits serving the community and gives food that cannot be sold but is still safe to eat to area residents in need, both addressing hunger and reducing food waste. What started as a single store in Portland run by three families and some friends has now grown into 19 neighborhood stores in Oregon, California and Washington and several more stores have been announced. But New Seasons Market is much more than a grocery store: It’s a community gathering space. The new Mercer Island location for example includes comfortable indoor seating and a covered outdoor dining area for friends and family to gather. Its warm and character-rich atmosphere emanates from the use of natural materials like the reclaimed Douglas fir from Seattle’s historic 1909 Union Stables. The selection at Mercer Island’s New Seasons Market is awesome. In their words, “From local, organic faves to the brands you’ve always loved, we cater to every craving.” That’s why you’ll find all kinds of pairings on their shelves: Organic cornbread mixes next to Jiffy, non-GMO candies next to Skittles, organic soba noodles next to Top Ramen, and premium-grade pure maple syrups next to Mrs. Butterworth’s. Yes, you’ll even find Cool Whip next to Truwhip. Ready for a tour? Let me show you around the store! You’ll find the freshest, locally-grown seasonal produce but if there’s something you need that’s not in season, chances are they’ll have that, too. One of the first things I noticed is their bulk fresh herbs section. There are countless times when all I need is just a tiny sprig of something or a few mint leaves for garnish and end up having to buy a whole package of the herb. 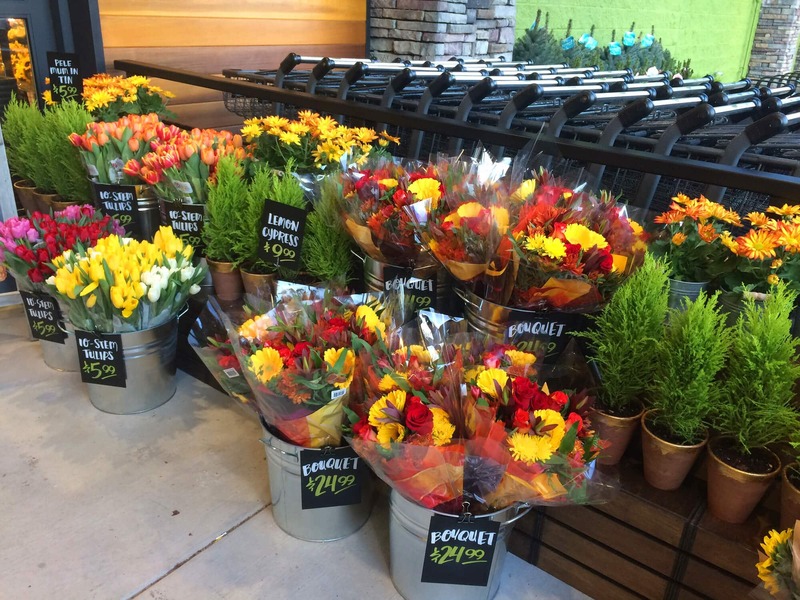 New Seasons has the perfect solution – just take what you need. 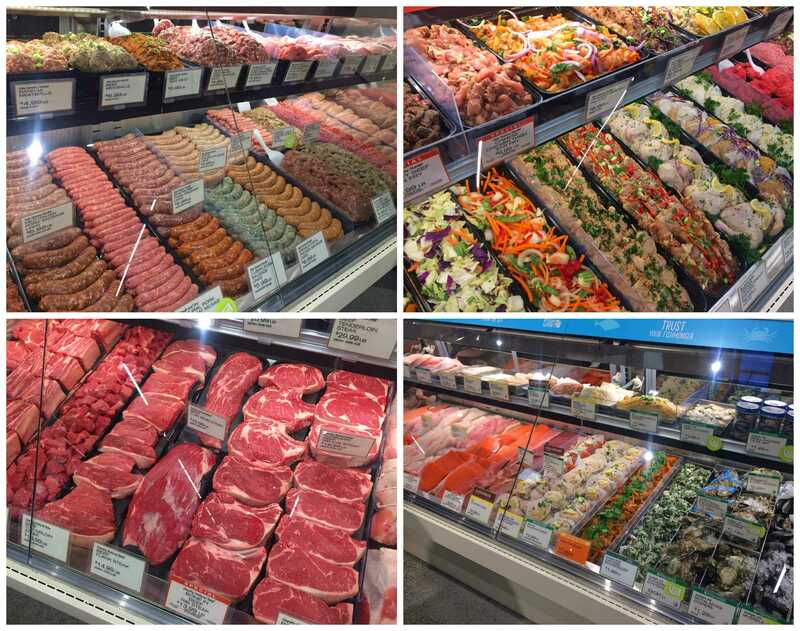 Check out their gorgeous meat department. If you’ve never thought of meat as beautiful, just look at this! The staff grinds their meat in-house from all muscle and even makes their own sausages. For your convenience they also sell ready-to-cook items like stir-fries and seasoned chicken. They stock the freshest seafood and their meat is all natural without hormones or antibiotics. 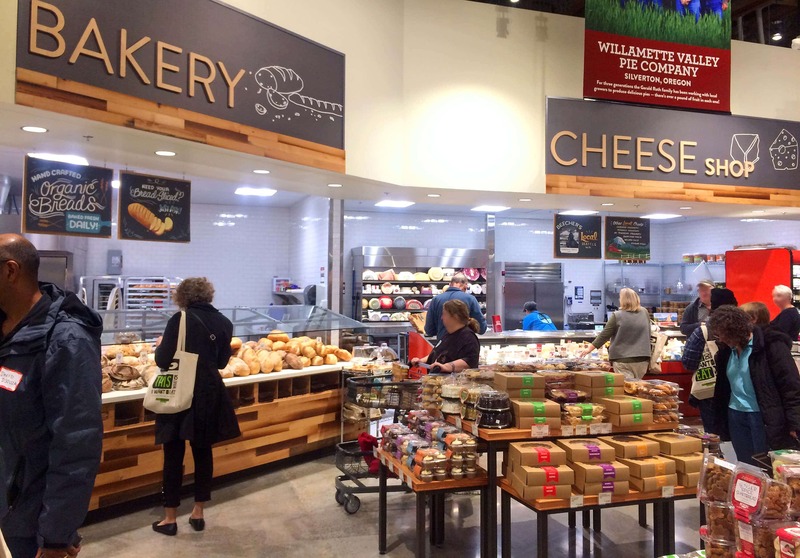 In the frozen section you’ll find the national brands you’re already familiar with along with great local products like pies from Whidbey Island and frozen fruits from Remlinger Farms. The bulk section has a great selection of dried goods including herbs, spices, coffee beans and dispensers for grinding your own nut butters. The health and beauty section is stocked with some fun and aromatic local goods like artisan soaps, creams, oils, etc. Here you can also find conventional over-the-counter medications for a variety of conditions along with all the natural alternatives. They also have a great selection of natural cleaning products. 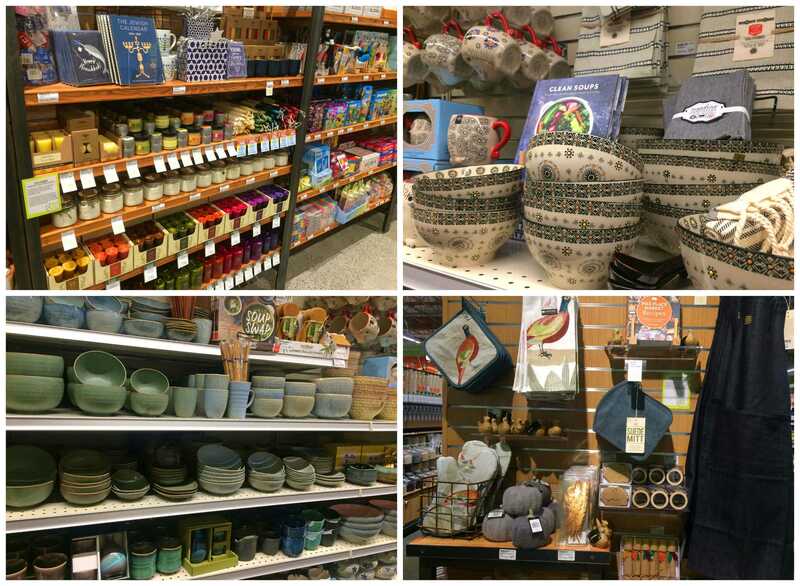 New Seasons Market also carries some household products like candles, dishware, dish towels and gifts, many of which are crafted by local artisans. And then of course there’s one of the most important sections in the store…the chocolate! You’ll find a terrific selection of goodies here including some of my favorite cookies from Germany and Great Britain and premium chocolates like Seattle’s own Theo’s. Needless to say I stocked up. The bakery offers a nice selection of hand-crafted organic artisan breads, many of which are non-GMO. 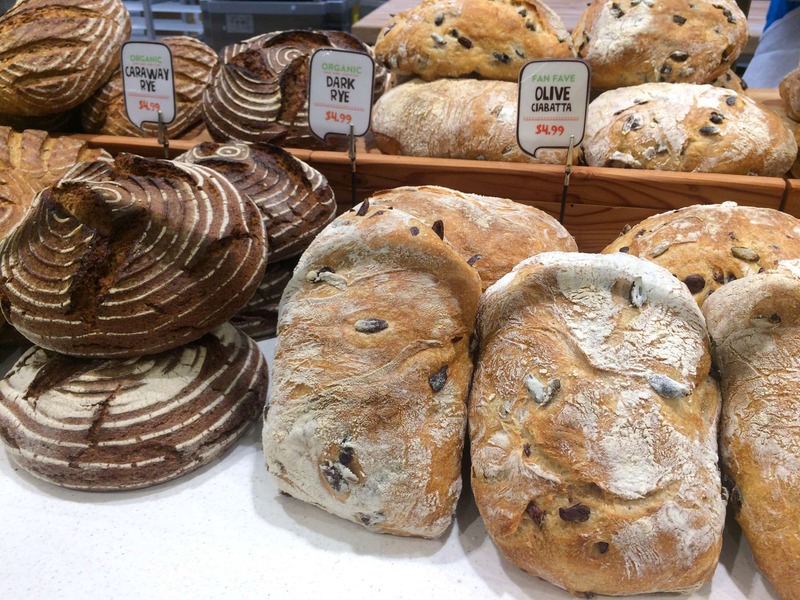 Breads are baked fresh daily and they currently offer 14 varieties. I sampled some at the store and took some home with me. They are excellent! They have a full-service cheese counter with knowledgable staff who can explain all the varieties to you and cut however large or small of a wedge you need. At the deli you can find a nice variety of cold cuts (look at that great selection of salami, yum) and some wonderful premium products like pâté. 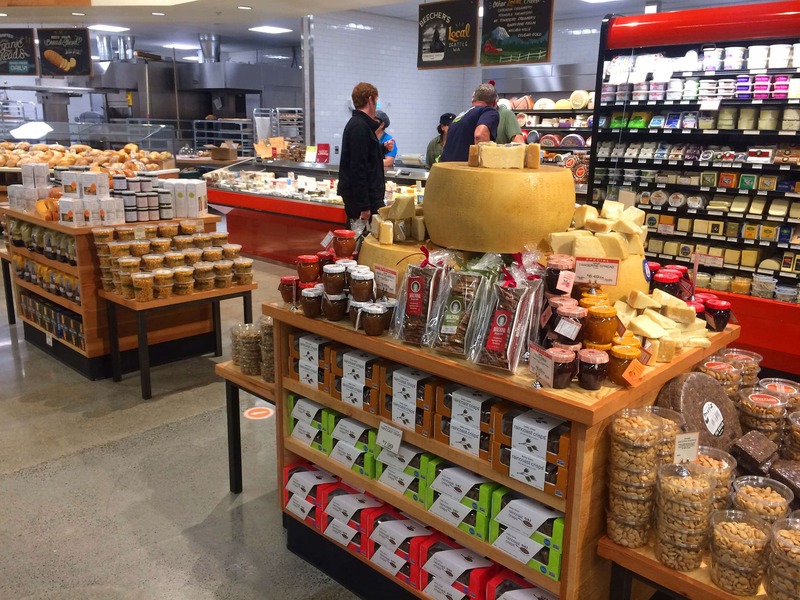 Something that New Seasons Market really excels at is a fabulous selection of prepared foods for busy people who want great-tasting food to go. 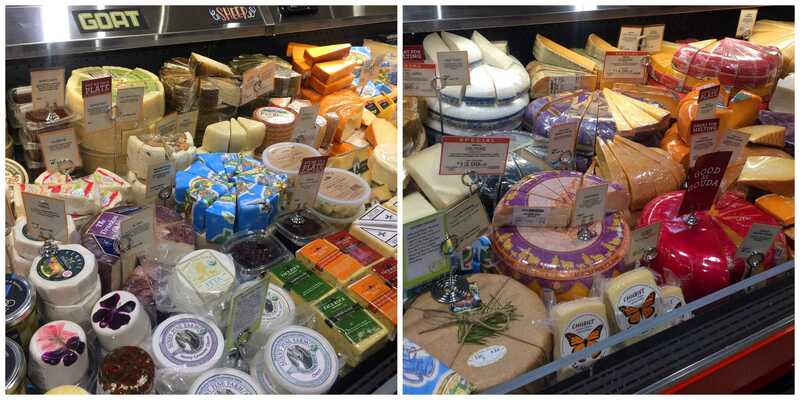 Take a look at these luscious offerings at the deli counter. 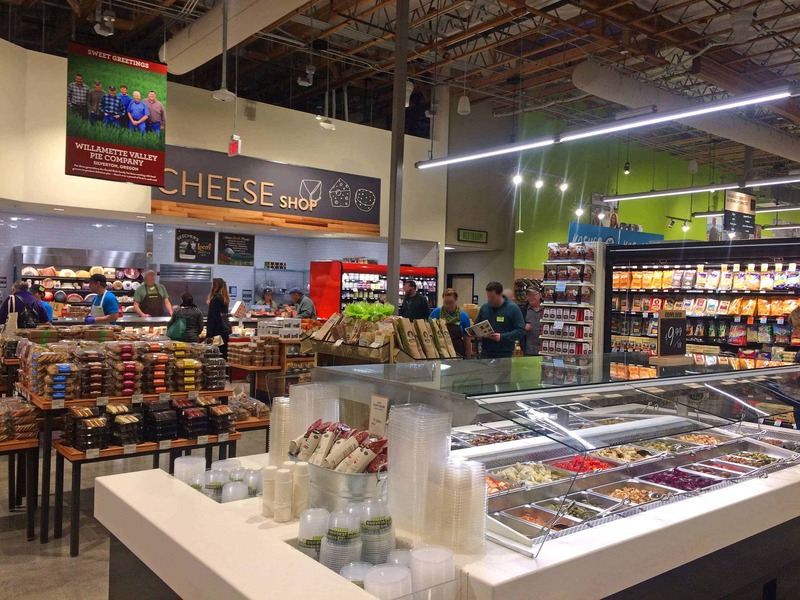 Across the aisle from the deli you’ll also find some great grab-and-go food items like sandwiches, quiche, empanadas, granola/ yogurt parfaits, salads and sushi (made fresh daily). There are also hot and cold self-service bars where you can find everything from mac and cheese to soup and salad. The selection of ready-to-eat foods is terrific. Made by in-house chefs, the options are diverse and plentiful. And just when you thought it couldn’t get any better…in steps the Wok Station! Choose a protein (or not), noodles or rice, all the veggies your heart desires, a sauce, and then watch the chefs cook it all up for you. I got mine to go and for $8.99 and I had a large serving that left me happy and full. 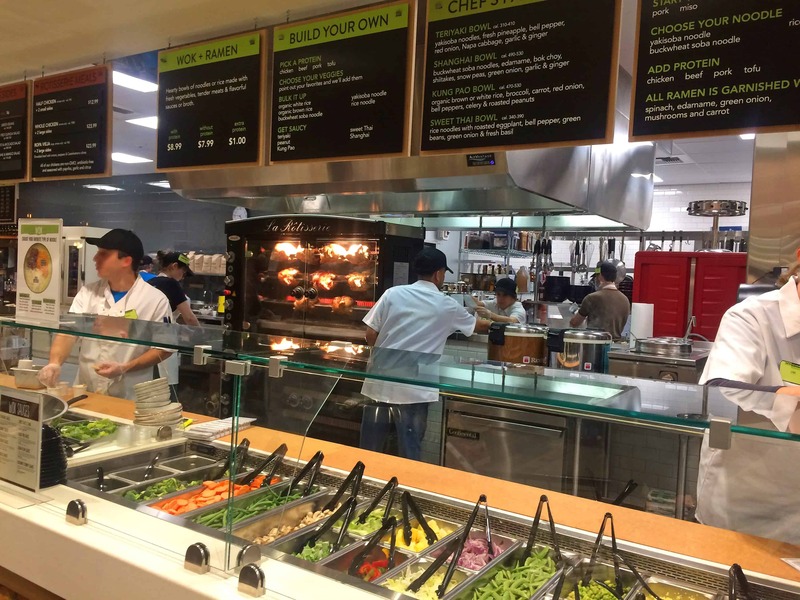 In addition to the wok station there’s a rotisserie chicken station and a station for made-to-order sandwiches. And then of course there’s dessert. Get an eclair, cupcake or some petit fours along with a hot chocolate and then grab a chair in the indoor seating area. I seriously need to come back here with my husband for a date night! In-store nutritionists who you can schedule consultations with for FREE. Three high-speed electric car charging stations. The new location is on Mercer Island at 2755 77th Ave. S.E. It opens its doors November 10th at 7 a.m. as the first “ultimate neighborhood grocery store” in the Puget Sound. There are some fun activities planned for the rest of the week (including free chocolate and ice cream samples!). Check out the full schedule of events. 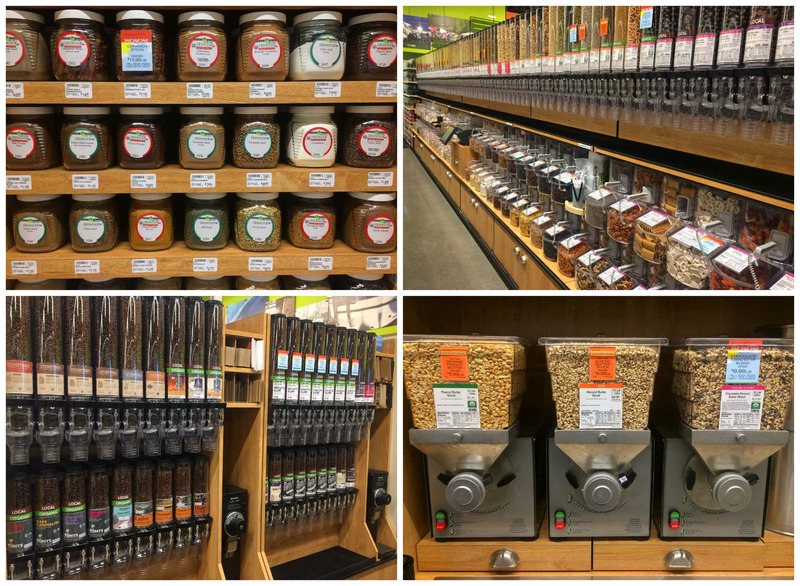 Disclosure: I’ve teamed up with New Seasons Market to bring you a series of posts about my experience with their awesome stores. Thank you to my readers for supporting the brands that help make The Daring Gourmet possible! I’m a grocery store geek too! I would love it even more if I could go to that grocery store and pick of a few of those gorgeous items! YES, I’m not alone in my geekiness! :) Awesome, Amy, I hope you get the chance to visit New Seasons, you’ll love it! So exciting! I’m also working on this campaign and so excited about the store! Awesome, Alyssa! Such a great store and I’m super excited we have one of our own now! I’m a grocery geek too and do enjoy grocery shopping. This store looks fantastic and I know I could easily spend hours there. I love that they sell items from local craftsmen, that’s so nice. Another grocery geek, hoorah!! :) Yes, you could totally lose track of time here. I know, I’m so thrilled of how supportive New Seasons is of local vendors! I wish we had them in my area! There’s nothing I enjoy more than scouting out a new market. This looks like a great one! 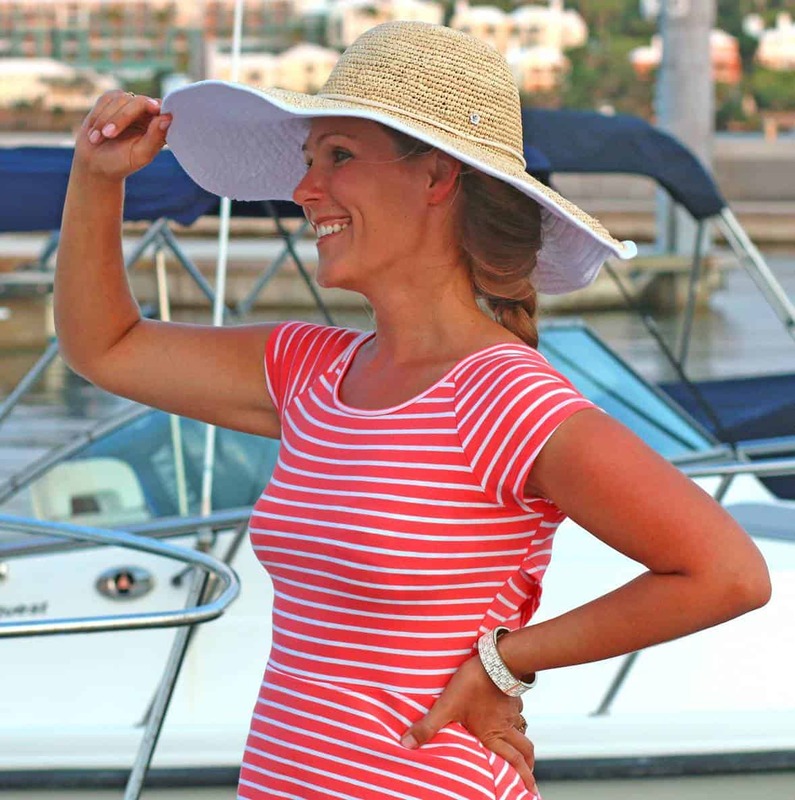 It’s a gem for sure, Renee, I hope you have the chance to check it out! Oh wow, I’m super jealous that I don’t live in Seattle! O. My. Goodness! We need one on the east coast. Thanks for the tour. I LOVE New Seasons!!! I’m so excited that you finally have one as well. Enjoy!! I’ve been to the New Seasons Market in Portland several times and it’s awesome. They’re doing a great thing for the community. Great selection from local vendors, friendly staff and an all around good vibe. Great article, I’m looking forward to checking out the new store on Mercer Island. I couldn’t agree more, Nathan. I’m so glad you’ve been able to visit the Portland store. You’re going to LOVE Mercer Island’s new store! I, too, am a grocery store geek. I love checking out new stores and will wait outside like I’m in line for concert tickets. This store looks amazing! Hooray, Kellie!! :) Thanks for reading and I hope you’re able to check out New Seasons! 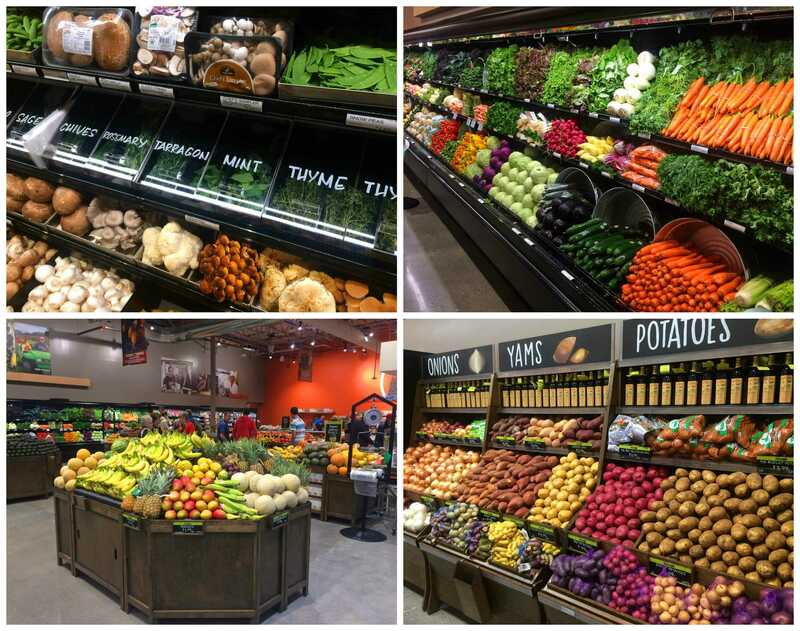 What a great article about our fantastic new grocery store! We are looking forward to many family outings and date nights hiking down the hill to the store and choosing from the sumptuous selections to eat on site. Terrific, Karina, and you’re so lucky you’re in walking distance from the store! Wow that bread is calling my name. What a wonderful spot for healthy grocery shopping!